May 3rd is exciting, but don’t miss the rest of Opening Weekend! On Saturday May 4th join us for a Sandlot Extravaganza! 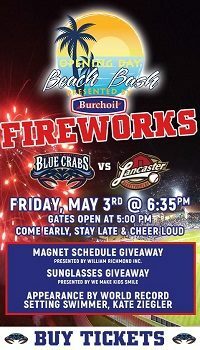 Meet Chauncey Leopardi “Squints”, Watch a baseball themed Post-Game Fireworks Extravaganza, and get your 2019 Blue Crabs Magnet Schedule presented by William Richmond, Inc.! Sunday May 5th will be a Cinco de Mayo Celebration – and we want to see you there! Bring the family to our Cinco de Mayo party! Celebrate incredible Hispanic culture and enjoy Mexican food while you watch your favorite local team wrap up their 2019 debut!